Laurion Mineral Exploration Inc. (TSX-V: LME) recently announced an agreement to acquire a 100% interest in the Bell Mountain Gold property located in Churchill County, Nevada. The property is a near-term gold/silver production property in west-central Nevada, on which the Company plans to begin a drilling program to verify and expand the resource in order to provide a NI 43-101 compliant resource estimate prior to production. The property was originally developed and permitted in 1992 and consists of three defined gold and silver bodies with an estimated resource of 2.1 million tonnes grading 1.33 g/t gold and 37.55 g/t silver. Using $1,200 gold and $18 silver, we calculate the Company’s estimated current resource (non NI 43-101 compliant) to be approximately 127,828 gold equivalent ounces. As of the date of this release and according to http://www.goldminerpulse.com, the average market capitalization per ounce of gold equivalent was $104.97. 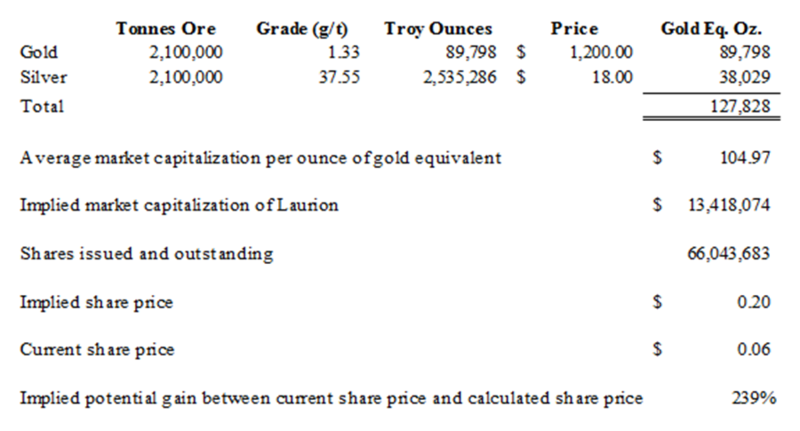 By applying the $104.97 per gold equivalent ounce to the Company’s estimated 127,828 gold equivalent ounces, the Company’s implied and calculated market capitalization may be more fairly valued at $13.4 million or $0.20 per share, as is illustrated in the table below. With a drilling program being planned right now, we believe the Company should have plenty of news to report on during the second half of 2010, which in turn should bring the current share price more in line with its implied and calculated share price. For additional information about Laurion Mineral Exploration Inc. and its opportunities, please refer to the Company´s most recent corporate presentation, available at http://www.babybulls.com. Also, please refer to our disclaimer, which is also available at http://www.babybulls.com. Amid all the market doom and gloom, the world’s largest gold fund is quietly celebrating another major milestone: SPDR Gold Shares, an exchange-traded fund backed by physical bullion, has recently surpassed $50 billion in assets. As a follow up to completing patient enrollment and sample collection in connection with its Phase II pilot study, John Cousins, President and CEO of Biomoda, Inc. (OTCBB: BMOD), is presenting its proprietary CyPath® diagnostic assay for the detection of early-stage cancers at OneMedPlace’s mid-year finance forum in New York on Wednesday, June 30, 2010. Cousins’ presentation will be Webcast at approximately 3:20pm Eastern Daylight Time on Wednesday, June 30th, and can be viewed live online by clicking here. Laurion Mineral Exploration Inc. (LME.V) has entered into an agreement to acquire a 100% interest in the Bell Mountain Gold property located in Churchill County, Nevada. The property is a near-term gold/silver production property in west-central Nevada, on which the Company plans to begin a drilling program to verify and expand the resource in order to provide a NI 43-101 compliant resource estimate prior to production. The Bell Mountain Gold Project (the “Property”) is contained entirely within the Fairview Peak caldera; its inter-caldera setting is a very favored environment for gold deposits in the region. Gold mineralization within the Property occurs as electrum (Au, Ag) and Acanthite (Ag S). The mineralization forms an epithermal, low-sulfidation, volcanic-hosted, caldera-related deposit located in the prolific Walker Lane structural province of Nevada, which is the host to many major gold producing districts such as the Comstock, Round Mountain, Paradise Peak, Bullfrog, Tonopah, Goldfield, Rawhide and several others. Previously permitted for production in 1992 by N.A. Degerstrom Inc. (“Degerstrom”). A study of abundant drilling data and underground workings from the Property suggests that the resource calculated by Degerstrom in 1991, is open to significant expansion and could be increased considerably, both laterally and at greater depth. The deposit is drill tested to a maximum depth of 75m with an average depth of 45m and is open along strike. Additional attractive targets have been identified on the Property with little exploration outside the known resource. Lawrence Williams: Gold Price Manipulation – Probably; Conspiracy – A Matter of Semantics! LONDON – Is the gold price being manipulated? There are those who say no, while others say yes – notably The Gold Anti Trust Association (GATA) – and on balance it looks to an impartial observer (relatively) that the answer is probably in the affirmative. But perhaps no more so than any other commodities and some stock prices. There is a whole mammoth industry out there – the big banks, hedge funds etc. – whose whole purpose is to make money from money and the more you have in the first place the easier it is to do. Not by producing anything useful, but through manipulation of prices through short selling in huge volumes to drive prices down, buying on the turn, allowing prices to rise back up, taking profits, then more short selling to drive prices down again and the cycle continues. This works better in a bull market, which gold has been in for the past ten years or so. The New York Times dedicated a chunk of last Sunday’s paper to gold as a mainstream investment. In other words, gold is now legit — no longer can it be dismissed as the asset of choice for fringe types with a cellar full of canned goods and a stash of bullion buried in the backyard. And to illustrate just how far gold has moved into the American mainstream, the paper goes bipartisan by holding up investor George Soros on the left and commentator Glenn Beck on the right as examples of the newly converted. You are currently browsing the BabyBullTwits blog archives for June, 2010.